Oriana Fallaci died almost five years ago but her writings live on. She won fame especially for the knowledge, cunning, and feistiness of her interviews with world leaders such as Yasir Arafat, Robert Kennedy, Mohammed Reza Pahlavi, Ariel Sharon, Lech Walesa, and the Dalai Lama. A collection of some of the best are out this month in a new book in English, Interviews with History, Conversations with Power" (Rizzoli New York). 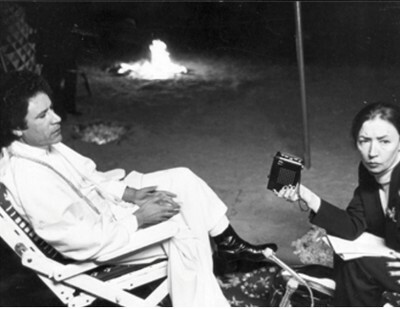 Oriana Fallaci interviewing Mu'ammar al-Qaddafi in his tent in 1979. I can survive the attacks of the whole world. And because my Green Book has resolved man's problems, society's problems. America can wage war against us, the West can torment us, it doesn't matter: the world has my Green Book. All we need to defend ourselves is the Green Book. Judging by the operations currently underway, Qaddafi finds himself in need of more protection than what his Green Book provides. Typical current headline, this one from FoxNews.com: "Qaddafi Forces Reportedly Fire Cluster Bombs Into Civilian Areas." That would be Libyan civilian areas, specifically Misrata, the country's third largest city.